Be the first to share your favorite memory, photo or story of Lt. Col August "Gus". This memorial page is dedicated for family, friends and future generations to celebrate the life of their loved one. Gus has completed his last flight and has landed at the Throne of God. Born into a large family in southeast Ohio, his father and brother provided for the family working in the local coal mines. After graduating high school he attended Miami of Ohio University on a football scholarship and became a consensus All-American while earning his Business degree. Gus was commissioned an Air Force Officer after graduation and began his pilot training shortly there after. Gus married Marilyn Beyers in her hometown of Roscoe, SD in 1959 and they began raising their family as they moved around the country. He served his country proudly for 29 years, and was a B-52 Command Pilot during the Vietnam War. After retirement from Offutt AFB, Gus and Marilyn owned and operated two Baskin Robbins stores for a number of years to the delight of their kids, grandkids, and family friends. Gus is survived by his loving wife Marilyn; children, Paul (Diane) Holubeck, Chuck (Leslie) Holubeck, Steve Holubeck, Kristen Reeser and Mary (Dave) Rahmel; 8 grandchildren and sister Helen. Gus never met a stranger, and was a mentor to many who he crossed paths with. Services have been entrusted to John A. Gentleman Mortuaries and Crematory, Bellevue/Sarpy County Chapel 3402 Samson Way Bellevue, NE. 68123. 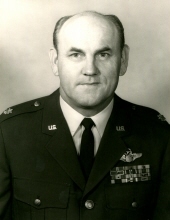 To send flowers or a remembrance gift to the family of Lt. Col August "Gus" Holubeck (Ret. ), please visit our Tribute Store. Peyton Holubeck, Gus's granddaughter, received life saving cancer care at St. Judes. The family is requesting memorials be made to Marilyn so that she can donate them herself. "Email Address" would like to share the life celebration of Lt. Col August "Gus" Holubeck (Ret.). Click on the "link" to go to share a favorite memory or leave a condolence message for the family. memory of Lt. Col August "Gus"